On May 12 Utah actualized nearly 500 new laws that span the legislative panoramic, with everything from seat belts to a law that reclaims Utah’s status as the only state with the firing squad as a legal way to execute. Seat Belts – Previously, if you were older than the age of 18, you could be ticketed for not wearing a seat belt, but only if pulled over for another offense. 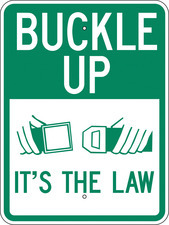 Beginning on May 12, the new law states that not wearing a seat belt is a primary offense, meaning that police officers can and will pull a driver over if he or she is not wearing a seat belt. The same goes for a passenger. The law allows for an officer to give a warning on the first offense and a $45 fine on the second that can be waived upon completion of a 30-minute online safety course. Powdered Alcohol - If you were hoping to experience powdered alcohol, a powder that you can sprinkle into your water to give it an alcohol content, you’re out of luck … if you live in Utah. Utah made the sale of powdered alcohol, or “Palcohol,” illegal just a day after the Alcohol and Tobacco Tax and Trade Bureau approved the new product. Body Cameras – At the cost of nearly a half-million dollars, the Department of Safety has plans to equip all state police officers with body cameras. The new law mandates that police must be recording when carrying out forceful search warrants, in order to give the public a chance to experience what transpires when the rubber meets the road. The exhaustive list of new laws can be found by visiting http://le.utah.gov.